At any point of the year every person starts off on a daily journey called ‘routine’ with some of the daily presumptions. With a perceived thought to drive fast and covering up the lost time, jumping the traffic signals and expecting the unexpected traffic often results in risky driving and over-speeding on the roads and is a common sight. However little do the drivers know that this could change their lives forever or maybe the last journey. It is an alarming situation but in India around 150,000 people become victims to road accidents every year and yet there is no remorse. It is just the grieving families that live with the feeling of “what if” or “I wish”. Honestly, most of the road accidents can be averted with some basic regards for road discipline and consideration for others. It is sad but true that most of the accidents and fatalities happen because of irresponsible driving and mainly because of over speeding. So, if we want safer roads for ourselves, our families, friends, colleagues, pets – it becomes imperative to make a conscious effort to change our attitude towards road safety standards – and not just if we are driving or riding, but even if we are the ones crossing or walking. According to statistics from the World Health Organization, approximately 750 pedestrians die on the road every day, and 800 motorcyclists die every day in accidents globally. As per statistics from the World Bank group, Transportation for Development, say, less developed countries have a higher number of road fatalities, which is mainly due to lack in appropriate infrastructure, poor vehicle safety standards, and inadequate driving laws. 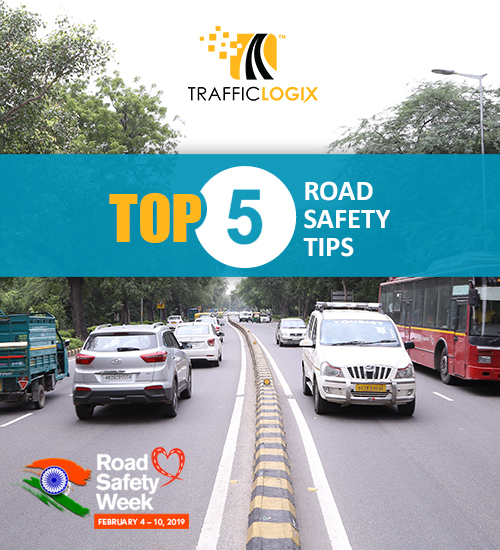 As a part of the ‘Road Safety Week’ from February 4 to 10 which will focus on the theme of “Sadak Suraksha – Jeevan Raksha” it will be good to adopt 5 basic safety tips to help build safe road, safe traffic and safe nation. Don’t use your mobile phone while driving as it could be hazardous, though laws have been enacted to prevent distracted driving, still calling and texting while driving have turned out to be a cause in a major number of road accident. Never violate red lights on the roads as they are meant to regulate traffic and prevent accidents. Nowadays RLVD (Red Light Violation Detection) technology can easily catch the violators and send Challan tickets to their home. Let us pledge today to adopt these 5 basic Road Safety Tips and prevent from unpleasant eventualities. PreviousPrevious post:Traffic Safety Week Statistics – They are not just numbers; each of them was once a life!NextNext post:Creating The Network – Let Us Connect The Way Our Roads Do. Traffic Safety Week Statistics – They are not just numbers; each of them was once a life!